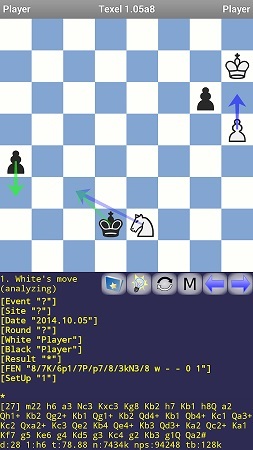 a free UCI compliant open source chess engine under the GNU General Public License developed by Peter Österlund. Texel, first released in March 2012, was basically a C++11 port of Peter's Java engine CuckooChess, the name change inspired by HMS Cuckoo, which was wrecked on April 04, 1810 on the Haak Sands off the Texel at Callantsoog. Texel applies many of the standard methods for computer chess programs, such as iterative deepening, negascout, aspiration windows, quiescence search with SEE pruning and MVV/LVA move ordering, hash table, history heuristic, recursive null moves, futility pruning, late move reductions, opening book and magic bitboards. Texel 1.02, released in June 2013 , had a number of mostly small changes, new evaluation features, and speed ups, such as only one check in quiescence search, cache line aligned entries of the transposition table, cache-optimized magic bitboard constants, support for SSE4.2 PopCount, and reduced aspiration windows with gradually widening after fail-high/low at the root. Texel 1.03, released in January 2014, was a huge improvement of about 100 Elo over Texel 1.02 using one core , mostly due to automated tuning of evaluation parameters . Further, beside other tweaks, Texel 1.03 incorporates a unique recursive parallel search using threads, combining the power of DTS with the simplicity of ABDADA , and further applies null move verification and more aggressive LMR, but no longer uses the Botvinnik-Markoff extension. Texel 1.04 in May 2014 is about 70 elo stronger than Texel 1.03 on Peter's Linux computer at very fast time controls, using one core. Almost all changes are improvements in the evaluation function . Texel 1.05, released in January 2015, is about 57 elo stronger than Texel 1.04 on Peter's Linux computer at very fast time controls. The most notable changes are support for Gaviota and Syzygy tablebases , singular extensions , detection of 16 pawn fortress positions. and support for multi-threaded search on Android devices. Further improvements are due to more aggressive LMR , disabling of LMP in PV nodes , check extensions for negative SEE moves only if the remaining depth is small, and bonus for pieces protected by pawns . Texel 1.06 was released in July 2016, and supports polyglot opening books, and comes with many search and evaluation improvements, beside others, more aggressive LMR and null move pruning, maximum number of search threads up to 512, support for Windows NUMA systems having more than 64 cores, a small (512KB) per-thread evaluation hash table, and a 4-way set associative transposition table. Texel 1.06 is around 40-50 elo stronger than Texel 1.05 in self play at very fast time controls . On September 30, 2017, Texel 1.07 came with a new parallel search based on Lazy SMP  and ABDADA  able to use computer clusters, and further supports large pages in Windows . This page was last edited on 27 February 2019, at 09:35.